Tag line: "Capra's Greatest Hit --- The Screen At Its Most Inspired!" Disillusionment with the American political system is commonplace nowadays. Forged hundreds of years ago by men with the best of intentions, the American system of Government has, for all intents and purposes, gone sour. In director Frank Capra's Mr. Smith Goes to Washington, we meet a man on the inside, who identifies the corruption and doesn't take it lying down. He believes there's something left in the system worth fighting for, and it's in his fight, and his cause, that Mr. Smith Goes to Washington sets itself up as a true American classic. The powers that be of an unspecified state are in a predicament: one of their Senators has unexpectedly died, and just as an important bill is set to go before the Senate that will make many of them very wealthy men. With their riches in jeopardy, they scramble to appoint a replacement, and fast. Jim Taylor (Edward Arnold), a powerful mogul who stands to gain the most from this bill, convinces Governor Hubert Hopper (Guy Kibbee) and senior Senator Joseph Paine (Claude Rains) that the smartest move would be to appoint an inexperienced man, one they can control. Thus begins Jefferson Smith's (James Stewart) political career. A local hero who founded a popular boys club, Smith is new to government, and has no experience with the backroom deal-making that goes on in Washington. But even he isn't wet enough to miss the fact there's something odd about his appointment, and before long, Jefferson Smith is doing exactly what many hoped he wouldn't do: he's asking questions. James Stewart's impeccable ability to play the everyman brings a believability to Jefferson Smith, a decency we identify with almost immediately. Proud to be an American, Smith can recite the speeches of Washington and Lincoln from memory, and on his 1st day in the nation's capital, he stands in awe at the foot of the Lincoln Memorial. At first, neither his new assistant, Ms. Saunders (Jean Arthur), nor the cutthroat Washington press know what to make of him, but it's not long before they realize Smith's innocence isn't an act, and his love for his country is very sincere. However, when Smith sees how things actually work in the hallowed halls of Congress, he puts his down-home charms and polite manners on the back burner, and rolls up his sleeves for the fight of his life. This courage in the face of adversity provides Mr. Smith Goes to Washington with its infectious, uplifting spirit. Look, I know how hokey this all sounds, but it's the film's naive sensibilities that make it so endearing. Capra goes to great lengths to paint a bleak picture of American politics, then picks us up with the promise it can be different, that there's a chance to correct it all before it's too late. 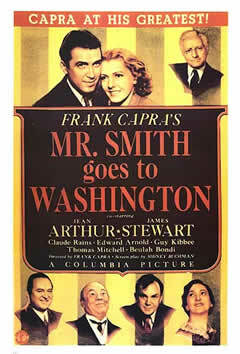 Hokey or not, I really enjoyed Mr. Smith Goes to Washington. Love this movie so much. Though I think most of the 1939 films deserved the Oscars they won, I still sort of wish Stewart had won the best actor that year. It's one of his best performances.